You may not think about it but your crawl space is a good source for mold, germs and other destructive bacteria. Most people think about dehumidifying their living areas as that is where they spend most of their time. But if you want your home to be completely moist free and healthy, you need to dehumidify your crawl space. Here are the top 5 crawl space dehumidifiers that will help you make your house a healthy home. 1. Why is Your Crawl Space So Wet? 3. How Will A Crawl Space Dehumidifier Help? A crawlspace may get wet because water found a way into it. Most ﻿﻿humidity problems in crawlspaces are caused by cracks in the home's foundation or walls. These cracks actually let water inside your home and make it feel damp. Some other causes may include improper ventilation, lack of regular maintenance and poor drainage systems. It is also important to take care of the dirt floor in crawl spaces by sealing it to avoid moisture from coming inside the home. A wet crawlspace is always a bad sign about a house's structure. If you have a wet crawlspace, you can suffer consequences like mold and mildew growth. If the crawlspace is moist, the organic matter found in the moisture makes it perfect for mold and mildew to populate the space. As we all know, mold and mildew can bring about many health problems to homeowners. Aside from mold buildup, the house's structure may also deteriorate because of moisture. If the structure of the house weakens, more cracks may appear on the walls and allow even more water accumulation into the home. Aside from that, it can also allow pests like rodents and other insects to enter the area. Also, a large percentage of air that goes in and circulates the home comes from the crawlspace. The air below your home seeps through your floors and around your heating and air ducts. Thus, the air surrounding your home is going to be unsafe. Hence, if the air below the house is riddled with bacteria because of the mold and mildew buildup, the air you are breathing inside your home may not be safe for your health. Some of the health problems related to this type of problem include headaches, respiratory complications as well as fevers. Hence, it is very important to keep your crawlspace dry and safe from mold or mildew buildup. The consequences mentioned above can easily be addressed by keeping the crawlspace dry. Moisture and water can cause a lot of problems. Wet insulation, as well as standing water must be extracted. There are various ways to do so, but experts believe that using a dehumidifier would be the best option. Most homeowners use vents to keep their crawlspace dry. However, experts believe that this is not enough because it can add more damage to the already impaired walls. Installing a vent entails putting a hole in the wall for the vent to get into. This may cause even more cracks to the wall and collect even more water at the edge of your home. Other homeowners put up gravel and vapor barriers to keep humidity levels low. This, however, does not consider the fact that moisture can still find a way into the crawlspace through the dirt floor. A vapor barrier cannot keep the water out because of the already existing cracks that continuously let water in. Therefore, it is important to get a dehumidifier that can do just that. Price - Never go over your budget. Not all dehumidifiers come with a big price tag. If you do your research, you will surely find one that is within your living expense budget. It is harder to get into debt just because of your dehumidifier purchase. This product is aimed to protect your home and not be the cause for you to lose your home because you can no longer handle your living expenses upon its purchase. Size - Dehumidifiers usually come in bulky sizes. So, it is best to choose a dehumidifier that will perfectly fit in your home and address your needs. It is also best to buy a portable dehumidifier because it can be easily transported from one place to another. A portable dehumidifier will be perfect if you need to change homes. You can easily ship it to your new address instead of living it behind your old home. Other Features - Most dehumidifiers come with features like air filtration, automatic switch, remote control and alarms. It is best to look into the added features of the product before purchasing. Air filtration is best for highly humid basements to ensure that bacteria build up will be avoided in the space. Energy Consumption - Dehumidifiers are big machines that can consume large amounts of energy. Again, it is better to stay within your means. So, if you buy a machine that consumes huge energy power, you may end up with bigger utility bills. Hence, it is important to check the energy consumption of the products you are looking into before buying. Here are top 5 best crawl space dehumidifiers﻿ on the market today just help you choose the suitable one for your home. This commercial grade dehumidifier may only be about 12 ½ inches in size but it pulls more than its weight in moisture from your crawl space. You can expect up to 80 pints of moisture taken from your crawl space every day. The unit is rated for spaces measuring up to 7000 square feet. Its built-in humidistat and touch controls leave you in charge of dehumidifying your crawl space. Its special water damage design allows you to restore those areas of your home that have received damage by too much moisture. Also, the unit comes with power cord and drain hose holders and you can drain excess water directly into a sink. The automatic restart function gets the machine up and running again on its own after a power failure. It works quite well and up to expectations. Perfect for crawl space moisture problems that harm your home. Then the unit does not use that much electricity as it does its job. The PHD 200 unit can be suspended from your joists for better operation. The included straps are strong enough to hold this 12 ½ inch dehumidifier up in the air. Along with the straps, you get a long power and drain cord, allowing you to place this unit where you need it most. You also can drain the removed moisture directly into a basement sink with ease. The drain hose hooks up directly to the unit and should be long enough to reach a sink or basement drain. Even if you do not have enough light, you can still set the controls easily. The touchscreen allows you to set your humidity level and other functions with a touch of a finger. Plus, the unit is rated for up to 15,000 cubic feet so no area in your home is too large for this dehumidifier. The built-in condenser pump works well and is very handy. It is also very compact making it easy to move from place to place. The two handles help make moving this crawl space dehumidifier into place very easy. Then, you can place this unit in just about any sized room or crawl space measuring up to 2,600 square feet. You can dry out your crawl space fast as the unit can remove between 90 and 198 pints of moisture per day. It just depends on the settings. Its heavy-duty pump is designed to last long even after giving a hard day’s work every day. Then the coils are epoxy powder coated to help prevent corrosion. You can forget about crawling to the unit to reset the controls. This dehumidifier comes with remote control features and controller. Also, if you live in a cold climate region, this unit will work at temperatures starting from 35 degrees F.
The hot gas system to defrost coils is superb. Plus, the filters fit well and leave no space for moisture to escape. Once in place, it goes about doing its job well and in a more than satisfactory manner. You can get up to 70 pints of moisture removed from a room measuring up to 2200 square feet in size. 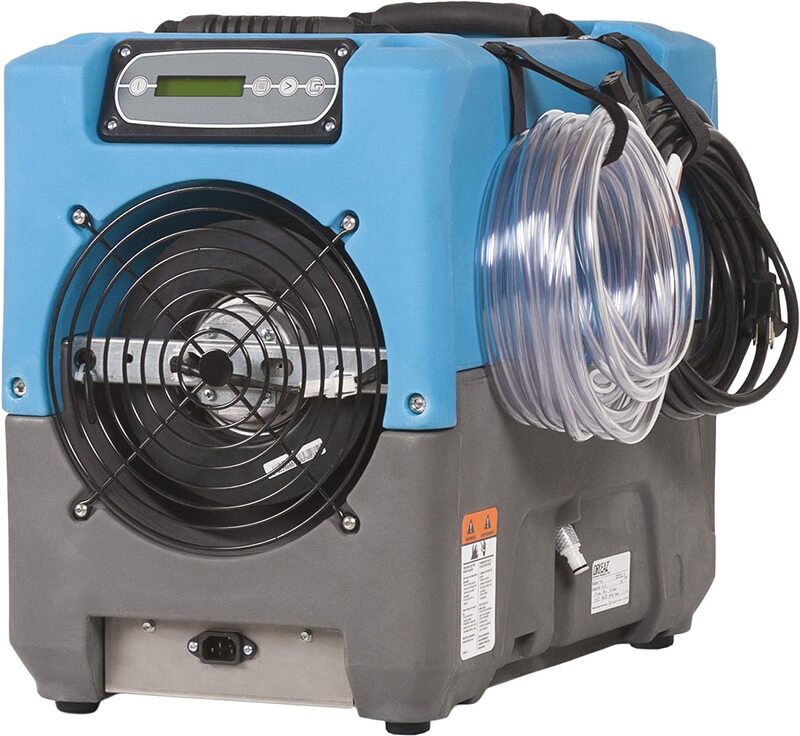 Its included drain hose allows you to drain the dehumidifier directly into a basement drain or sink. You can also direct the removal outside if you want. The unit is easy to operate. Place the dehumidifier on a level spot, plug it in, then set the humidity levels you want and turn it on. After that, you just forget about it as the unit will operate automatically. Its coils are made from corrosion resistant aluminum and are designed to last you long time. With easy access to the control panel, you can change the settings any time you want. This industrial unit can run 24/7 every day without fail. It is also easy to install and can be done by just about any do-it-yourself handyman. The unit takes only a few hours to bring humidity levels down to desired levels. This little unit is designed to remove between 55 and 120 pints of moisture per day. For best results, do not place it in a room measuring larger than 1300 square feet. You will find the control panel on the side of the dehumidifier and all it takes is one finger to set the levels you want. Feet levelers help you keep the unit level and stable. But just in case, try to place it on a level spot in your crawl space. The anti-corrosion construction material helps keep this unit running and it will work in temperatures as low as 36 degrees F.
A remote control allows you to place this dehumidifier in an inconvenient spot and still give you access to its features and functions. Its digital display makes sure you can understand what setting and levels the unit is operating at. The company backs its product with great customer service. Most of the time their units work as expected and provide more than the desired results. You may not think that keeping the moisture levels low in your crawl space is important. But if you remember that the crawl space walls and ceiling are connected to the rest of your house, you may see the importance of using a crawl space dehumidifier. A crawl space dehumidifier will protect portions of your house that you do not even see. This is a plus, as damage to the structure can lower the value of your house if you decide to sell it. Protect your home with one of the top 5 crawl space dehumidifiers and maintain the value of your home. It is a smart move to make.